"La Brabançonne" is the national anthem of Belgium. The originally-French title refers to Brabant; the name is usually maintained untranslated in Belgium's other two official languages, Dutch and German. Liberty Leading the People is a painting by Eugène Delacroix commemorating the July Revolution of 1830, which toppled King Charles X of France. 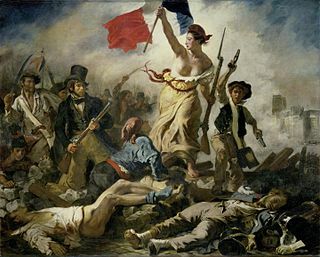 A woman of the people with a phrygian cap personifying the concept of Liberty leads the people forward over a barricade and the bodies of the fallen, holding the flag of the French Revolution – the tricolour, which again became France's national flag after these events – in one hand and brandishing a bayonetted musket with the other. The figure of Liberty is also viewed as a symbol of France and the French Republic known as Marianne. The Flag of Niger has been the national symbol of the West African Republic of Niger since 1959, a year prior to its formal independence from France. It uses the national colors of orange, white and green, in equal horizontal bands, with an orange roundel in the center. The flag forms one of the official national symbols of the Republic of Niger, with the coat of arms of Niger, the National Anthem, the crest, and the motto: "Fraternité, Travail, Progrès". These form Article 1 of the first part of the 1999 Constitution of Niger. The flag is similar to the Flag of India, although the ratio, shade of orange, and symbol in the center differ. 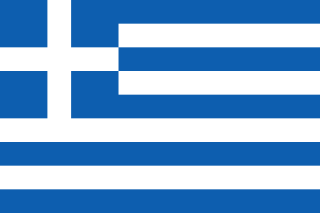 Eleftheria i thanatos is the motto of Greece. The Great Seal of France is the official seal of the French Republic. The Gallic rooster is an unofficial national symbol of France as a nation, as opposed to Marianne representing France as a State, and its values: the Republic. The rooster is also the symbol of the Wallonia region and the French Community of Belgium. Travail, famille, patrie was the tripartite motto of the French State during World War II. It replaced the republican motto, Liberté, égalité, fraternité of the Third French Republic. Antoine-François Momoro was a French printer, bookseller and politician during the French Revolution. An important figure in the Cordeliers club and in Hébertisme, he is the originator of the phrase ″Unité, Indivisibilité de la République; Liberté, égalité, fraternité ou la mort″, one of the mottoes of the French Republic. A Temple of Reason was, during the French Revolution, a temple for a new belief system created to replace Christianity: the Cult of Reason, which was based on the ideals of reason, virtue, and liberty. This "religion" was supposed to be universal and to spread the ideas of the revolution, summarized in its "Liberté, égalité, fraternité" motto, which was also inscribed on the Temples. Within the Temple of Reason, "atheism was enthroned". English theologian Thomas Hartwell Horne and biblical scholar Samuel Davidson write that "churches were converted into 'temples of reason,' in which atheistical and licentious homilies were substituted for the proscribed service". Guillaume-Charles Faipoult was a French aristocrat, soldier and politician who was Minister of Finance during the French Revolution. He then represented France in Italy, where he organized the newly formed republics. During the First French Empire he was prefect of the Scheldt department, and then Minister of Finance in Spain under Joseph Bonaparte. Faipoult was prefect of Saône-et-Loire during the Hundred Days.